However handsome your top hat, the wrong fit or size can ruin the overall look. 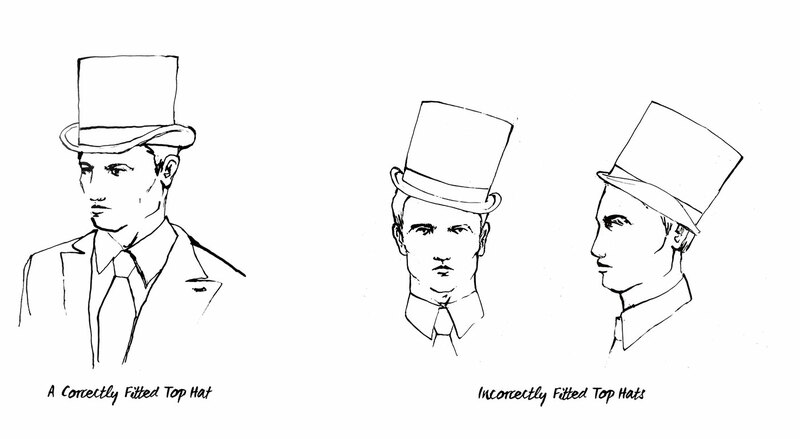 Get it right by following our step-by-step guide to measuring for a top hat and achieving the perfect fit. 1. Take a soft tape measure and place it around your head. Ensure it’s half an inch above your ears and straight. 2. 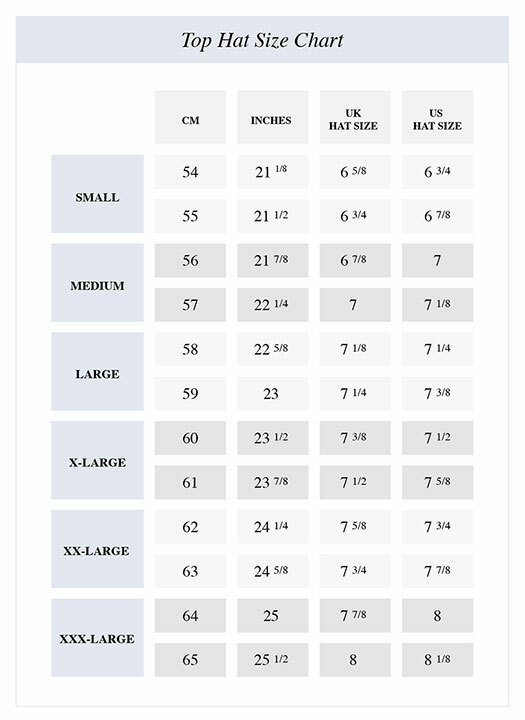 Measure in centimetres or inches, and use this measurement to find your hat size on the chart here. 3. 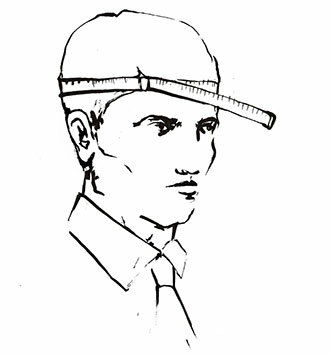 A correctly fitted hat should rest comfortably half an inch above the ears, sitting completely straight. Not titled to the side, or to the back. Should I buy an antique silk top hat or a modern version? Oliver Brown stocks a range of antique and modern top hats for hire or purchase - both of which can be worn to any formal occasion. Black antique silk top hats are conidered the height of beauty and elegance because of their impressive shine, shape and lightness, which is second to none. The modern versions we carry are the fur felt top hat in black and grey, and although these styles tend to be bulkier they do last well. In addition we have the 'Melusine Top Hat' and its taller counterpart the 'Hetherington Ascot Top Hat' which are the closest alternative to an original silk top hat, but finished with ‘melusine’ fabric, they don't have the same impressive shine, look and lightness as an antique silk top hat. Which shape of hat should I choose? The shape and height of antique silk top hats evolved somewhat over the years, with the crowns gradually becoming taller in height and the brims narrower. The most common shape of antique silk top hats is the ‘bell-shape’ which has slightly curved sides, but there are also examples such as the ‘stove-pipe’ which has straight sides and is particularly tall. The shape you opt for is a personal choice, for example if you have a smaller head you may want to opt for a crown that’s lower in height to keep everything in proportion. Which colour top hat should I choose? Antique silk top hats are largely found in black, but can also be brown or grey (which is often referred to as ‘white’ even though they are in fact grey), and although extremely rare, from time to time we have these colours available at Oliver Brown. In addition, we always carry the modern top hat made of fur felt in grey. Whilst black is sometimes thought of as more formal, any colour can be worn to finish a morning suit or tails, and worn to all occasions. I’m attending Royal Ascot. Which top hat should I choose? If you’re looking for Royal Ascot top hats and have access to the Royal Enclosure, the dress code requires gentlemen to wear black or grey top hats without adornments such as coloured ribbons. The dress code is less restrictive within the Queen Anne and Windsor enclosures, however you’re welcome to adhere to the Royal Enclosure dress codes if you so wish. Oliver Brown is also in attendance at Royal Ascot each year, so you can be measured for - and purchase - your Ascot top hat on the day itself.